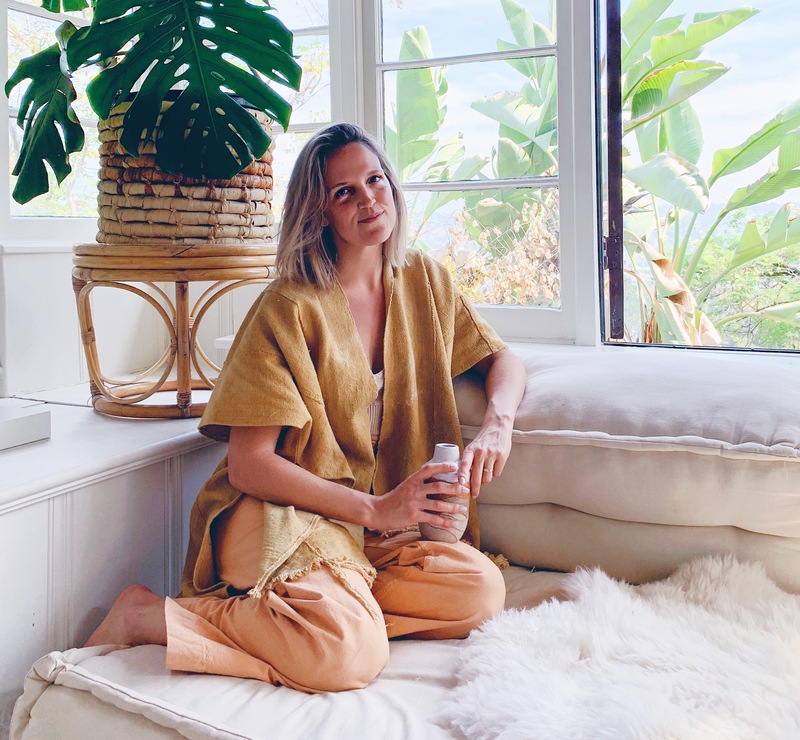 This evening I’m sharing a brand new adaptogenic dream tonic recipe and my favorite tips for promoting restful sleep. Though the winter months are more conducive for sleep because it’s colder and darker, I find my sleep is often times more disrupted during the holiday season. Whether it’s the stress or indulgent eating and drinking, sleep often suffers this time of year. We may wake up feeling unrested and may have a harder time falling asleep. Incorporating herbs and adaptogens into my daily routine over the past several years has improved the quality of my sleep tremendously. Adaptogens work to help the body better react to stress by balancing cortisol levels in the body. 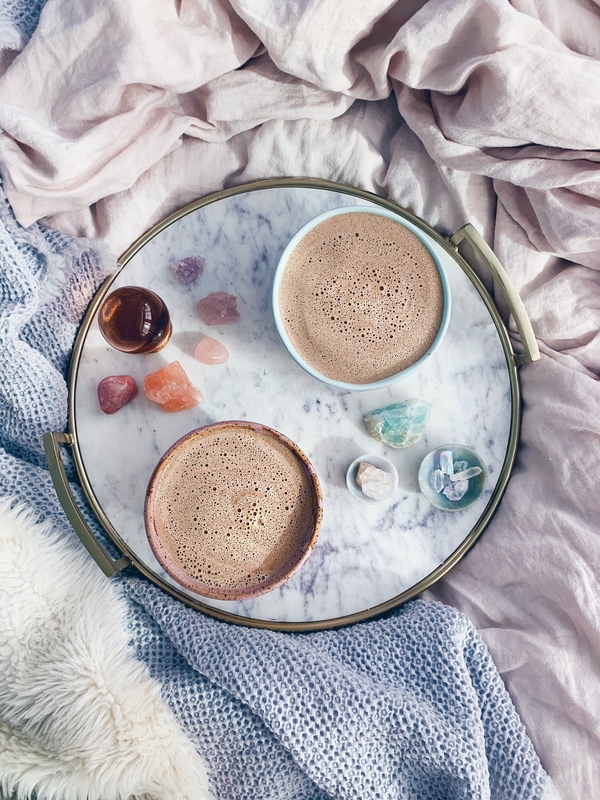 Because adaptogens work bi-directionally, they not only help promote relaxation and restful sleep, but also give us more energy and stamina overall. Adaptogens work to bring the body into better balance, giving our bodies the power to better respond to various external stimuli. I’ve been drinking Mountain Rose Herbs Dream Tea for years now, and I love it. When they asked me to make a dream tonic, I thought it would be lovely to use their tea mixed with a couple of my favorite adaptogens for sleep. This creamy tea latte is one of my favorites to drink an hour or two after dinner time. As always, Mountain Rose Herbs is one of my favorite places to source organic and sustainably harvested herbs. They offer a large variety of bulk herbs and spices, as well as some of my favorite tea blends out there (try the spicy, caffeine-free turmeric chai if you haven’t already). Creating a nighttime ritual that I look forward to is one of my favorite ways to get me excited about going to bed each night. I usually make a tea tonic (like the recipe below! ), turn down all the lights in my house, spend 30 minutes or so in the living room lounging, sometimes reading, other times talking with my husband. Then I dedicate about 15-30 minutes to my evening self-care routine. In the colder months, I might take a bath a few nights a week. Otherwise, I spend time taking care of my skin and teeth before getting into bed. By this time, I’m usually pretty wound down, but I usually like to read for about 15 minutes at least and/or take time to practice deep breathing. Shut off screens at least 1 hour before bed. And if possible, dim the lights throughout your living space. Soft, dim light signals the body to relax and that it’s time to wind down. Blue light, which electronic devices like our smartphones and computers emit in large amounts, does the exact opposite. It tries to trick the body into thinking it’s daylight. Waking up and going to bed at the same time everyday allows your body to get into a rhythm. As we create habits, our bodies respond either positively or negatively based on what these habits are. Our bodies love routine. Sticking to a regular sleep schedule will improve the quality of your sleep. If you want to start waking up earlier in the morning, at first it’s always challenging, but if you stick with the same sleeping schedule, over the course of a few months, your body should slowly adapt to your new bedtime and morning wake up time. This rule doesn’t apply to everyone, but if you are having trouble falling asleep or staying asleep, I definitely recommend limiting caffeine intake, especially after noon. Remove the clock from your bedside table. I can’t stress this one enough. There’s nothing worse than waking up in the middle of the night, turning over and seeing your clock staring back at you with the numbers 3:15AM in red. I never check my clock (on my phone, as I don’t have an alarm clock) if I wake up in the middle of the night or if I’m having trouble falling asleep. I know from experience that this gives me anxiety and then I usually have a very difficult time falling asleep. Instead lying there thinking about how soon in the morning I have to wake up. Set up your sleeping space for success. Lots of cozy blankets. Supportive pillows. Mood lighting. Plants. Crystals on your bedside. Whatever it is that makes you feel safe, calm and protected in your space. For enhanced dreaming, sleep with a piece of labradorite or spectralite by your bedside. I’m always impressed that this works. Crystals are magic! 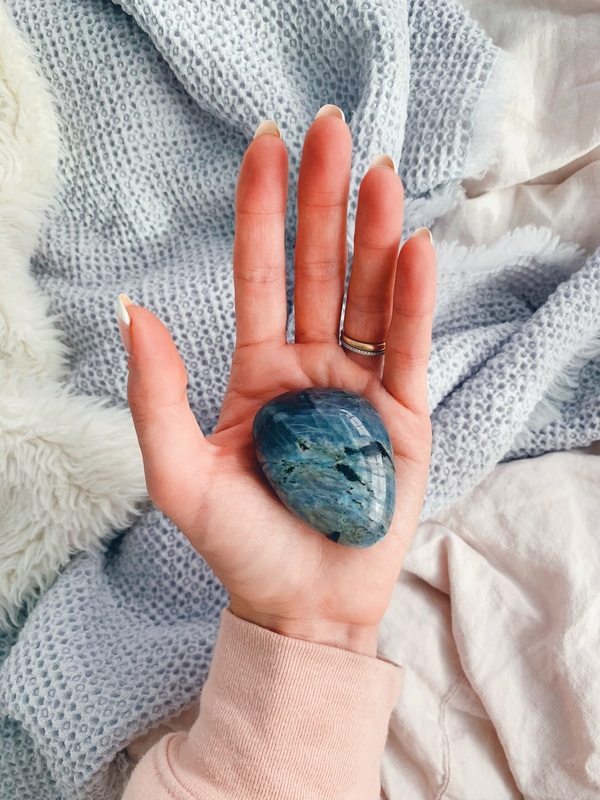 Whenever I sleep with a piece of labradorite or spectralite next to my bed or under my pillow, my dreams are much more vivid, and I usually have an easier time remembering them. 1.) Steep loose leaf tea in boiling water for 10 minutes. Strain through a fine mesh sieve and/or cheesecloth. 1.) Blend all ingredients with steeped Dream tea in a high-speed blender for 1-2 minutes. Serve, sip slowly and enjoy!